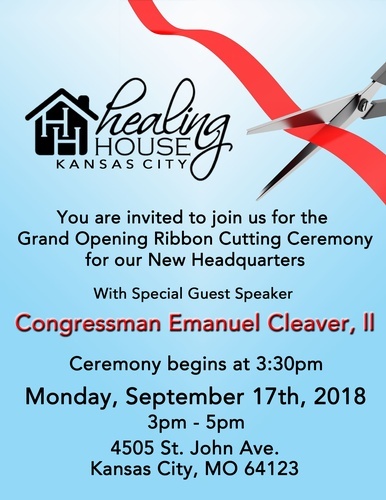 Please join us as we celebrate the Grand Opening of the Healing House's new Headquarters! Healing House, Inc. is a non-profit, faith-based substance abuse recovery organization. We work in the Kansas City metropolitan area to provide safe and stable homes with opportunities for spiritual and personal growth along with purposeful guidance and support for men and women who are committed to overcoming their addiction and becoming responsible, productive, drug and alcohol free members of our community. With Special Guest Speaker Congressman Emanuel Cleaver, II. Join us for networking, refreshaments, and celebration!